The Agricultural Proficiency Awards honor FFA members who, through their Supervised Agricultural Experiences have developed specialized skills that they can apply toward their future careers. Students can compete for awards in 49 areas covering everything from Agricultural Communications to Wildlife Management. Each award area has two categories, placement and entrepreneurship- although in some award area- those two categories are combined. Placement proficiency awards are given to those whose SAEs are related to employment, apprenticeships, or internships at an agribusiness or agriculture-related organization. Entrepreneurship proficiency awards are given to those whose SAEs are related to ownership of an agribusiness or agriculture-related organization. Proficiency awards are given out at the local, state and national levels. . Here in 2013, Oklahoma has advanced and brought to Louisville 20 National Proficiency Finalists out of the 49, which was the third most Finalists behind Georgia and California. By the end of the afternoon on Friday, Oklahoma had claimed 7 National Proficiency Titles, the most of any state. Ohio was second with six National Proficiency titles and Georgia was third with five. In 2012, Oklahoma FFA members earned 8 National Proficiency Awards. 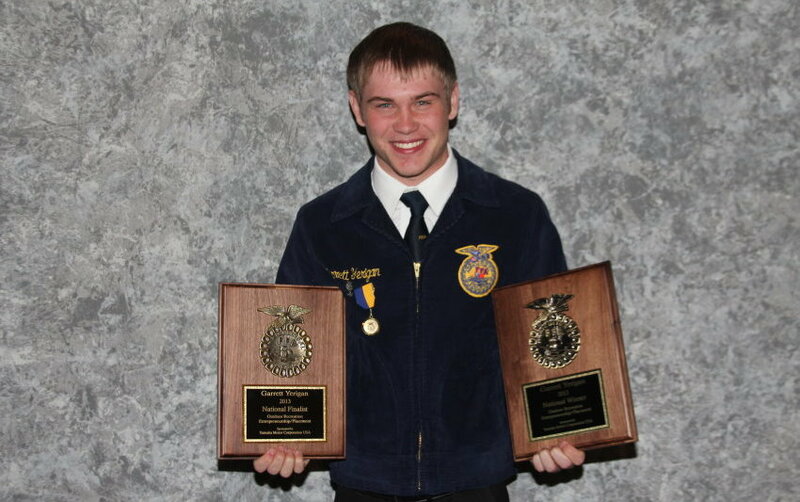 The 2013 National Proficiency award in Outdoor Recreation- Placement and Entrepreneurship has been awarded to Garrett Yerigan of the Pryor FFA Chapter. Garrett Yerigan would ride the rodeo circuit with his parents and was always memorized by announcers. He loved the way announcers could have the audience on the edge of their seats. When he was 6, he had the opportunity to announce the slack competition after the regular performance. It wasn’t long before he was devising a business plan and researching equipment to launch his own business, Lightening G Announcing and Sound. Yerigan is supported by parents Kathy and Dale and FFA advisors Walt Taylor and Jarrod Melugin. Yerigan has tasted success before on the National FFA Convention stage- winning a National Proficiency Award in 2012 as well. Click here for our story with Garrett from the 2012 Convention in Indianapolis. Farm Director Ron Hays talked with Yerigan about his Supervised Ag Enterprise after he received the National award on stage in Louisville at the 86th annual FFA Convention. You can hear that Interview by clicking on the LISTEN BAR below. Our exclusive coverage from the 2013 National FFA Convention in Louisville is a service of the Oklahoma FFA Association and the Oklahoma FFA Alumni Association. Click here for more information about this youth organization. FFA makes a positive difference in the lives of students by developing their potential for premier leadership, personal growth and career success through agricultural education. Ron Hays talks with Garrett Yerigan about his winning SAE.